My neighbor called me a couple of weeks ago. She was relatively calm as she asked if I would come over; she thought that she had found a snake. A snake? A snake. In her garage. Could I come over to help her? Please? I jumped up and headed out the door; I knew that she had a snake phobia. Larry and Zane followed for the entertainment factor; it was a Friday night. 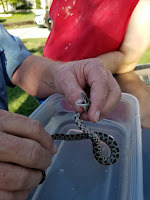 My neighbor had been cleaning out her garage, and she had found something wriggling in a glue trap. I picked up the box. Inside I found several deceased spiders, a lizard, a rather large roach...and a very alive snake. A baby rat snake was stuck to the glue. I pulled on it a bit, and the snake wriggled, trying to get away. It would die if it wasn't released. While I am pretty okay with picking up most snakes, I was worried about trying to get the snake away from the glue. I tend to get ham handed when delicacy is called for, both physically and verbally. I did not want to kill the very creature that I was trying to save. I looked at Larry, who pretty much gave me a look that said "NOPE." My dad loves snakes. He had snakes as a kid, growing up in Ohio. Every time I have a snake related emergency, he's my go-to. He also has a very delicate touch with these ultimately fragile creatures. I called him, and he came right over. His calm manner eased all of us, and he patiently explained that yes, this was a rat snake. Rat snakes are constrictors; they are not venomous. 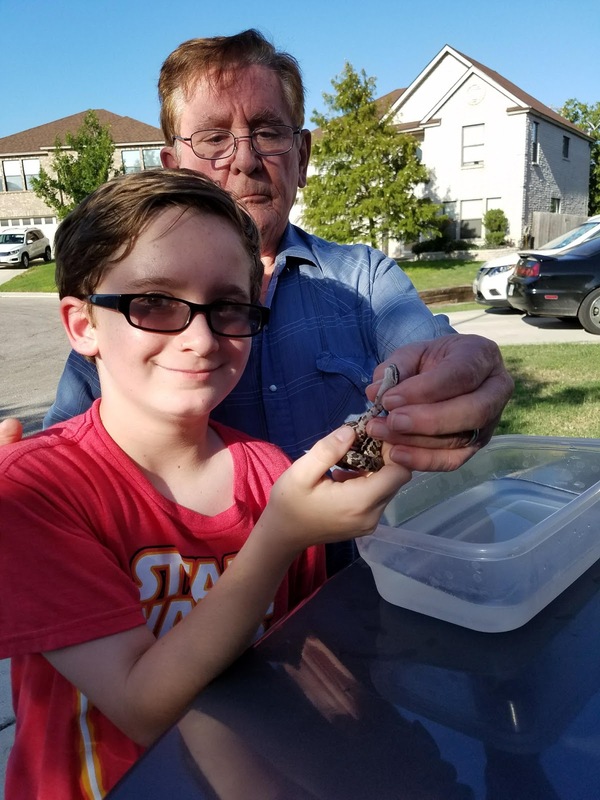 With a little tugging, he was able to free the snake. The next issue was about getting the residual glue off of the snake. I'd never given a snake a bath, but okay! Larry got a small tub with water, and whether he liked it or not, that snake got a bath, while my neighbor snapped pictures to show her friends. If the snake was embarrassed by all the attention, it didn't say. Zane was fascinated by all this, and finally, after my dad decided that the snake would not injure itself because of the glue, it was time to release the snake some place less sticky. I love seeing my son interested in the world around him, and I love that he made a memory with his grandfather. But not before a selfie!